The solution is quite simple to increase the desktop icon (symbols) number on the Windows desktop to place more desktop icons on the desktop! 1.) ... Desktop icon distance! 2.) ... Restore default Windows Fonts! 3.) ... Change Window Borders size on all Windows! By reducing the horizontal and / or vertical icon spacing (... see Image-1 Arrow-2) , more icons can be placed on the Windows desktop! It is independent of whether you change the desktop icon spacing at Windows 10, Windows 7, or 8.1, 8, or x64, or x32 (x86) version of ms-windows, it always works! (Image-1) Maximize the number of windows desktop icon! 2.) Restore default Windows Fonts! (Image-2) Icon ergo System Font Windows-10! 3.) Change Window Borders size on all Windows! Please In Windows Metrics change the Windows Border size (... see Image-3) Please always use ... the latest version of DesktopOK. DesktopOK - FAQ-21: How can I maximize the number of windows desktop icon (border, font size)? 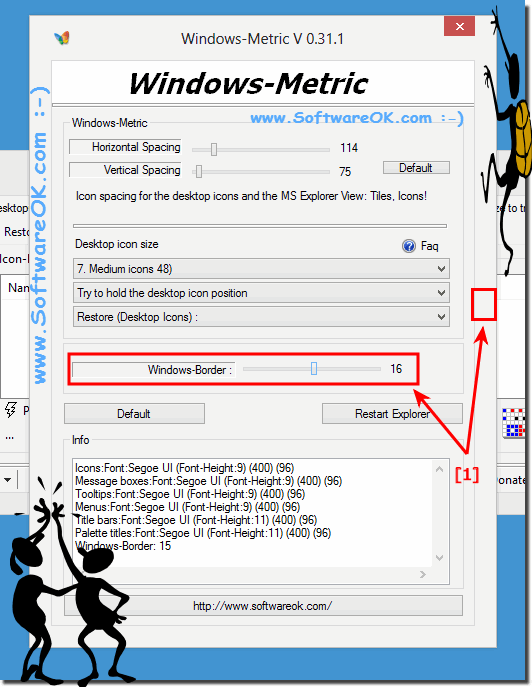 In DesktopOK I went to Windows Metrics and adjusted icon spacing from 100 to 90. The icons are now more compact, but the font is microscopic. Icon text is so tiny, it is unreadable. Windows Explorer and many dialog input boxes are also unreadable. I cannot do any file operations. I worked with Microsoft support on the phone for for 4 hours, and finally the only thing the could suggest is to create a new user account. What caused the fonts to suddenly become so tiny? How do I get them back to normal size? Hope you can help. ?